Girl Scout Cookies Season is coming this month. The Girl Scout Cookie Program is the largest girl-led entrepreneurial program in the world. In buying these cookies, you power the scouting experience. All proceeds stay local with the individual troops or the Greater Atlanta Council. 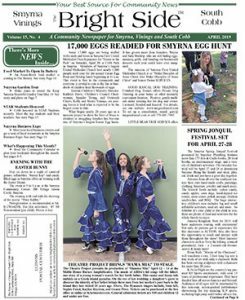 Girls in the Greater Atlanta Council have been going door-to-door or taking digital orders since January 1. The cookies arrive in Atlanta Feb. 16 and girls will be delivering them after that date. You will see Cookie Booths pop-up all-over town. Scout leaders ask that you support these girls as they work to raise funds to use to expand their scouting experiences through travel, enrichment, and of course, camping. Another option girls have is to donate cookies to support their communities. 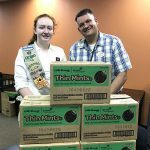 Cookies are $4 per box for Thin Mints, Samoas, Trefoils, Savannah Smiles, Tagalongs and DoSiDos and $6 for the Specialty cookies, S’mores and Toffee-Tastics. In 2018, a local scout with the support of long-time customers Judy McMillan and Janet Rau, both of Smyrna, was able to donate 60 boxes of cookies to The Center for Children & Young Adults (CCYA), a non-profit in Marietta. CCYA provides a home for youth who have been abused, neglected, or abandoned by their caregivers. The Center is located on a 4.9-acre comprised of three residential programs: Another Chance (co-ed ages 12-15), Open Gate (girls ages 12-15) and Life Works (co-ed ages 16-18). The Center provides comprehensive services, including housing, food, clothing, care, supervision and transportation for 40 youth. To support Courtney and her troop’s next philanthropic adventure, email the troop at GirlScoutTroop1872@gmail.com; they will gladly collaborate with you and develop a plan for donating to a mutual cause. In the past, the troop and Courtney have donated cookies to fire fighters, police, and veterans. To learn more about the cookie program, please see https://www.girlscouts.org/en/cookies/all-about-cookies/support-girls-success.html.